The global voltage stabilizer systems market appears to be fragmented because of the existence of numerous market players, observes Transparency Market Research (TMR). The leading vendors in the global market for voltage stabilizer systems – such as Get Electronique, Siemens AG, V-Guard Industries, and Voltas Limited – are emphasizing the enhancement of their product portfolios. Some of them have also been acknowledging the vast potential held by emerging economies and have therefore been attempting to tap the unmet needs in these regions. According to the lead author of the report, “Strategic alignments such as partnerships, mergers, collaborations, and acquisitions made by these market players will be crucial in the determination of the market shares of these firms”. The findings of the report by TMR reveal that the global market for voltage stabilizer systems was valued at US$14.11 bn during 2015. The market is slated to achieve a revenue worth US$25.39 bn by 2024, expanding at a reassuring CAGR of 6.66% from 2016 to 2024. By application, the global market for voltage stabilizer systems has been segmented into HVAC, communication system, building automation, consumer electronics, industrial, and power transmission and distribution system. The building automation segment is likely to exhibit maximum demand, reaching nearly US$4.29 bn by 2024. The greater inclination towards centralized control has been triggering the demand for building automation across several regions of the world. North America is expected to emerge as the dominant regional market, attaining 35.98% of the global voltage stabilizer systems market by 2024. The growth of this regional market can be attributed to the rising preference for automation across several industries. 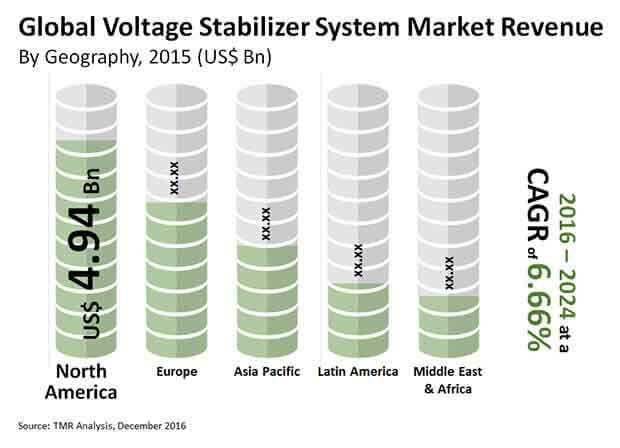 The voltage stabilizer systems market in Asia Pacific presents extensive growth opportunities, thanks to the recurring menace of voltage fluctuations across this region. One of the basic growth drivers of the global market for voltage stabilizer systems is the untapped potential of emerging economies such as South Africa, India, Russia, China, and Brazil, which are exhibiting exceeding demand for power transmission and distribution. As the number of distribution networks rises, the global market for voltage stabilizer systems will gain substantial impetus. The expansion of the market is likely to benefit from the constant need to provide reliable and efficient supply of power. The global consumer electronics industry is undergoing rapid growth owing to the towering demand for advanced devices. This has also stoked the growth of the global voltage stabilizer systems market. Moreover, the replacement and upgrading of older systems, especially in the developed countries of North America can pave the way for further growth of the global voltage stabilizer systems market. Contrarily, growing environmental concerns worldwide have been encouraging the adoption of greener technologies that are capable of conserving more energy. This can obstruct the growth of the market over the next few years. Also, as the voltage stabilizer systems market in developed countries near saturation, the demand for these systems might decline, further slackening the growth of the market. However, inadequate energy distribution in developing nations can ensure that the market keeps growing.